Clear skies. Low 64F. Winds SSE at 5 to 10 mph..
Clear skies. Low 64F. Winds SSE at 5 to 10 mph. UA players Andrea Constand, left, and Adia Barnes carry the 1996 WNIT championship trophy through the Tucson airport. Wildcats fans met the team at the gate upon their return. Adia Barnes averaged a team-high 17.6 points per game as a sophomore. She was named MVP of the 1996 WNIT. 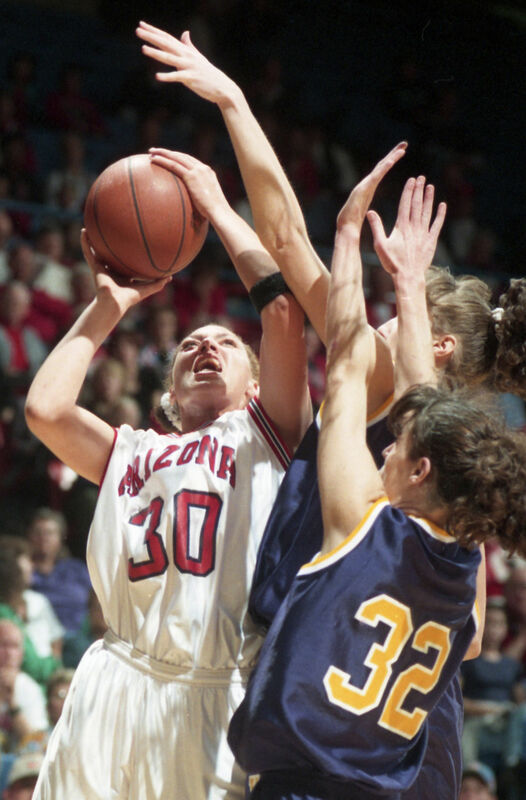 Arizona women’s basketball coach Joan Bonvicini during a game against Washington at McKale Center on March 2, 1996. So many years have passed — 23, to be exact — that it’s hard for the members of Arizona’s last WNIT championship team to remember specifics. “I’ve played a lot of basketball games since then,” said Adia Barnes, who was a UA sophomore then and is the Wildcats’ head coach now. What they do remember, however, is the feeling of winning three games in as many days after narrowly missing the NCAA Tournament. The Wildcats were 22-8 — and just outside the tournament field — when the WNIT came calling. Would they want to keep playing? Back then, the tournament featured just eight teams and was played at a neutral site. The Wildcats traveled to Amarillo, Texas, where they beat Western Kentucky, Arkansas and then Northwestern — the same team this year’s squad is playing — for the championship. The team drew its energy from coach Joan Bonvicini, says Andrea Constand, a forward on the team. Pantoja’s 13 assists weren’t even her season high. She had 16 — twice. There was another player on that 1996 team who had an outstanding run. Barnes averaged 17.4 points per game as a sophomore, and was named the WNIT’s most valuable player. Constand and Pantoja were also named to the all-tournament team. Barnes would go on to lead the Wildcats to NCAA tournaments in the next two seasons, and would leave the UA as one of best players in program history. Barnes’ old teammates still remember the energy she brought to the court. Players say the beauty of the WNIT wasn’t the game itself, but what the tournament represented. It marked the last time the seniors played together, and as a springboard to bigger and better things. Pantoja remembered what she called the “happy-sad” moment of winning the tournament and knowing the team would never play together again. That faded once the Wildcats saw the fan support they received upon returning home. “When we landed at the Tucson airport, seeing so many people there celebrating our accomplishment, that’s what Tucson is all about,” Pantoja said. And for their coach, well, the 1995-96 team will always hold a special place in her heart. Best video clips from Arizona's celebration after winning the 2019 WNIT championship.